Materials and Care: 100% Nylon. Hand wash cold, drip dry. 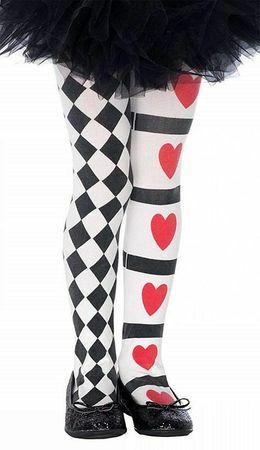 Available Sizes/Colors: Size "XL (11-13)"
Complete your child's costume with these nylon tights, one leg is black and white harlequin print and one leg is red hearts with black stripes. Perfect for your jester, Alice, or Queen of Hearts costume! The tops of the tights are solid white. Available in a several sizes to fit most children from 4 to 11.